This post has been updated and moved to the new blog. 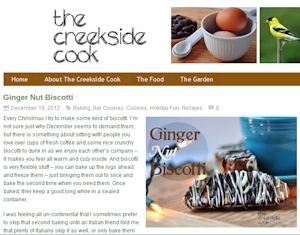 This entry was posted in Bars, Cookies, Desserts, Holidays, recipes. Bookmark the permalink. These look amazing. And my Italian nona never baked hers the second time! I tend to like my biscotti a bit on the soft side myself. These look terrific! Good to know there’s no need to bake them twice. Have a happy holiday! I love making and receiving biscotti around the holidays. These look like little bites of heaven. They’d go perfect with my cup of decaf coffee this morning. Thank you for sharing!